If you missed Thursday's concert at Pipeline Cafe by Soldiers of Jah Army (below), there's one more chance to see them Friday at Bliss. 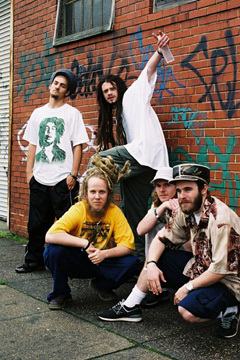 Based out of Arlington, Virginia, SOJA formed in 1997 and has released four albums in the past six years. Their latest, "Get Wiser," was released earlier this year. Doors open at 9:30 p.m. Friday at Bliss; local act Humble Soul will also be on hand to perform an acoustic set. Ardijah, 9 p.m. at Don Ho's Island Grill. Cover: $10. New Zealand's Ardijah brings its brand of "Poly-Fonk R&B" to Oahu for a performance alongside Lubei, Toa and Hi-Risk. Ryan and Betty-Anne Monga are the husband-and-wife duo that make up the band, which has been around for more than two decades and released its first album in 1988. Ardijah wraps up a 14-date tour on Oahu in support of their latest album, "Journey," following shows in New Mexico, Florida and California.